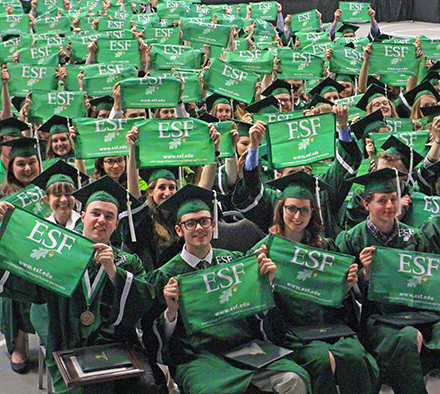 ESF's Class of 2017 joined the ranks of alumni Saturday, May 13, outfitted with their academic degrees and ESF flags to take with them on their adventures. The college conferred approximately 400 degrees during Commencement exercises at the SRC Arena and Events Center in Syracuse. One of the focal points of the ceremony was the speech by student speaker Abhinandan Mehra of Gurugram, Haryana, India, the first international student to be chosen as student speaker. Mehra declared himself "as Indian as it's possible to be" but said he would always be one of the Mighty Oaks - "a grateful student of ESF first." Mehra said the warm welcome he received on campus is the reason he was able to thrive during four years far from home. He told his classmates they leave ESF at a time of crisis, facing a world that is skeptical of science. But he said the graduates take ESF with them as they face the challenges ahead and he urged them to be eager to serve the world. Presidential Medal recipient Preston Bruenn '86 said the world needs solid science and trained professionals to meet growing conservation challenges. Bruenn is a legacy member of the Camp Fire Club of America, which helped establish an endowed conservation professorship at ESF. Bruenn's advice to the Class of 2017 was to set goals, never stop learning, give back to their community and use the ESF education as a foundation for the rest of their lives. A full list of students honored during the ceremony is available here.